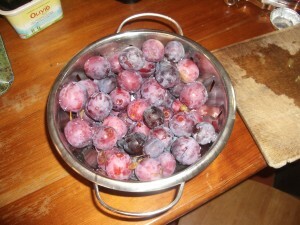 Here is my first batch of plums from our plum trees for two years. I picked 1.5 kg yesterday and there are more to come – not as bumper a harvest as two years ago, but there will be enough to make jam, crumbles and a few other things for the winter. Last year we didn’t have a single plum. I went for a walk last weekend and noticed that the blackberries are just beginning to ripen. I want to get out in the evening one day this week to pick some – I can’t wait to make bramble jelly again. My friend Piglet has given me a recipe for marrow and ginger jam. The only thing I’ve managed to grow this year is courgettes and they have gone mad. As soon as I turn my back, they are marrows. I’ve got two large marrows in the kitchen, and there are another 4 or 5 on the plants, so I need to do something quick. Everyone is getting a bit bored with marrow soup. I’m going to be making plum jam this evening, so I’ll let you know how I get on with that and my marrows. Are you making jam at the moment? I made plum jam on Sunday and also picked lots of (slightly underripe) damsons and made two batches of damson gin. I will me making damson jam when they are a little riper. I have rhubarb, black currants and raspberries in the freezer waiting to be turned into jam. I just need lots of sugar – and time!! !